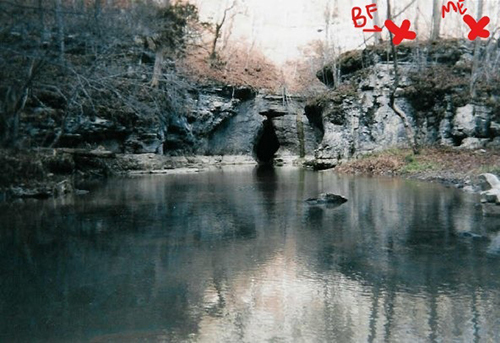 “My friend and I were camping just inside the cave where the water exits the cavern. It is a large room that you can enter through a large hole in the ceiling. It slopes down at an angle, and you can walk right in. We had been coming here about once a month for 6 months or so and camping. This night was a full moon and clear. We had built a fire inside by our sleeping bags and was getting ready for bed. I needed to relieve myself, so I walked up and out of the cave. As I was standing there doing my business, I was amazed at how the woods were lit up from the full moon, and a silvery light that was cast on everything. As I stood there admiring this awesome place, I heard a very low growl right behind me. I zipped up and turned around to see a very large, at least 8 foot tall Sasquatch only 10 feet from me! The moon was behind it, so I could not see its face, but it was huge and for a split second I was scared stiff. We stood there facing each other for a few seconds until my shock wore off enough to think, "okay, I am not a threat to you, and I'm going to walk back in the cave now." So I walked slowly to my right the 10 steps it took to get back to the opening. I then went back to the fire, were I kept my encounter to myself and stayed awake until daybreak. When the sun was coming up, we left to go home. I couldn't help thinking that I had invaded it's home, the cave. I never camped at that cave again, and only visit during the daytime. A few years later (2013), I camped in a tent on the same property, but a few miles from the cave, close to the house that sits on the farm. In the middle of the night, I started hearing a pack of coyotes howling in the distance. This was a little unusual to hear as at that time, because there was not a big coyote population in Jackson County. I went to sleep and was awakened by that same low growling I had heard years before. I knew it was the same creature I had come face to face with years earlier. As soon as it started getting light I packed up and got out of there. Since then, my great uncle told me a story about hearing strange yells coming from the valley below his house at night. He has lived here his whole life, and said,"he had heard every animal in the woods, but had never heard anything like this." He said "it made the hair on the back of his neck stand up!" The local sheriff also told a story about him chasing one across his property, and tracking it for awhile, until the trail went cold. That same morning his neighbor close by said she had seen it at daybreak when she went out to feed her cat. I called the witness. He was very articulate, calm and matter-of-fact on the phone. It is my belief that Glenn is a very sincere and credible witness. He never embellished his story when asked specific details. Glenn was 33 years old at the time of the encounter. The moon was directly behind the creature so unfortunately Glenn could not make out any details of the face. In addition, Glenn almost immediately looked down, as if an innate voice in his head said not to make eye contact. Glenn said he was never really afraid, for he felt like the creature was not going to harm him. 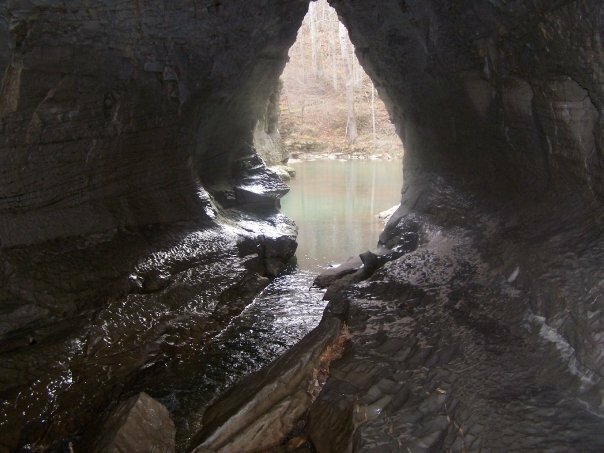 After just a few seconds, Glenn sort of side-stepped to his right and headed back inside the cave. Remaining calm in the face of danger can sometimes be beneficial, as in this case. 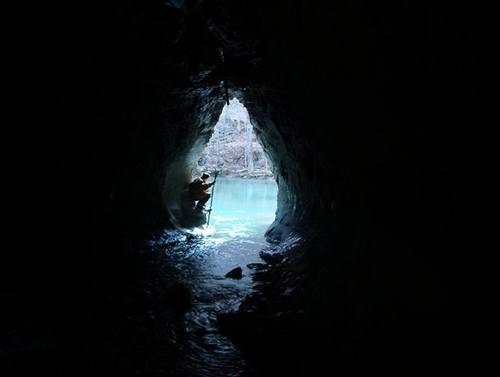 The mouth of the cave was not directly behind the creature, it was to the creature’s left. The creature never moved nor made another sound. When asked if it smelled, Glenn said no. Glenn thinks the creature walked up a path from the watering hole. He said, “I would have never have known it was there, until it made that first growl.” Glenn is 6’1” and had to look up at the creature so he thinks it was 8 foot tall. Its shoulders were very wide and long arms hung down by its side. I asked if the hair was long, matted, bushy or seemed groomed due to it being backlit by the moon. He thinks more groomed, or rather not obviously long or bushy. Glenn said it was only 8-10 feet from him and it could have easily grabbed him! Needless to say, he did not sleep the rest of the night, keeping an eye on the mouth of the cave. 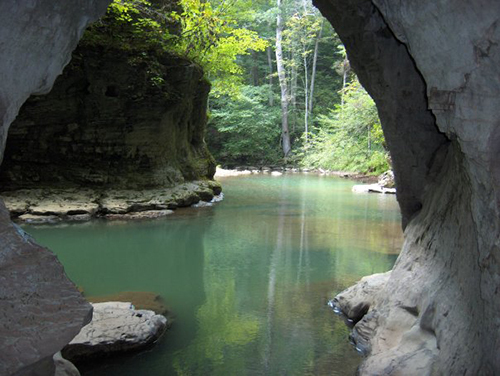 There are actually two openings to the cave, one overlooks the watering hole. Glenn had camped here for many years. It took about a year for him to return after the encounter, but has never camped there again.